Undated photo of Jones, who declined to make a final statement before he was killed this morning. 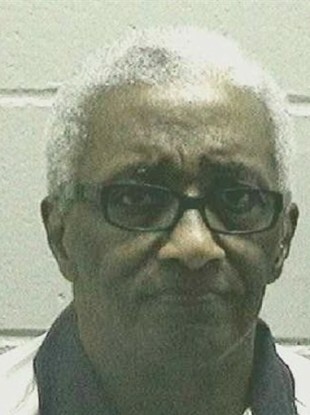 GEORGIA EXECUTED A 72-year-old man, its oldest death row inmate, early today for the killing of a convenience store manager during a robbery decades ago. Brandon Astor Jones was pronounced dead at 12:46am local-time this morning after an injection of the barbiturate pentobarbital at the state prison in Jackson. He was convicted in the 1979 shooting death of suburban Atlanta store manager Roger Tackett. Jones declined to make a final statement in front of witnesses but agreed to have a prayer read. Georgia doesn’t announce exactly when lethal injections begin, and the injection isn’t visible to observers. But the warden left the execution chamber at 12:30am, and records from past executions show the lethal drug generally begins to flow within a minute or two of the warden’s departure. Jones was initially still with his eyes closed and then swallowed a couple of times and moved his head slightly. He opened his eyes at 12:36 am and turned his head to his left, appearing to look toward a clock hanging on the wall. Then he closed his eyes again and took a few deep breaths before falling still. The execution had initially been set for 7pm and was delayed while the US Supreme Court considered appeals from Jones’ attorneys. They asked the justices to block the execution for either of two reasons: because Jones was challenging Georgia’s lethal injection secrecy law or because he said his death sentence was disproportionate to his crime. At around 11 pm last night by a vote of six to five, the court denied the requests for a stay, but several judges offered strongly worded dissenting opinions. “Today Brandon Jones will be executed, possibly in violation of the Constitution. He may also be cruelly and unusually punished in the process. But if he is, we will not know until it’s too late if ever,” wrote Circuit Judge Robin S. Rosenbaum. According to evidence at his trial, Jones and another man, Van Roosevelt Solomon, were arrested at a Cobb County store by a policeman who had driven a stranded motorist there to use a pay phone about 1:45am on 17 June, 1979. The officer knew the store usually closed at midnight and was suspicious when he saw a car out front with the driver’s door open and lights still on in the store. The officer saw Jones inside the store, prosecutors have said. He entered and drew his weapon after hearing four shots. He found Jones and Solomon just inside a storeroom door and took them into custody. Tackett’s body was found inside the storeroom. Tests showed each man had recently fired a gun or handled a recently fired gun, prosecutors said. The cash drawer had been removed and was found wrapped in a plastic bag. Jones was convicted in October 1979 and sentenced to death. A federal judge in 1989 ordered a new sentencing hearing because jurors had improperly been allowed to bring a Bible into the deliberation room. He was resentenced to death in 1997. Solomon, who was also convicted and sentenced to death, was executed in Georgia’s electric chair in February 1985. Email “Georgia has just executed its oldest death row inmate”. Feedback on “Georgia has just executed its oldest death row inmate”.